Choose a 9am or 2:30pm start time, then meet your private guide by the Spanish Embassy, close to the iconic Spanish Steps. On your 3-hour tour, you’ll stroll with your guide around the city on the trail of Bernini, Caravaggio, Michelangelo, and Raphael — some of the masters of Italy’s Renaissance and baroque periods. 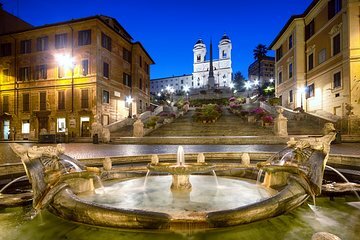 Visit the 17th-century Church of St. Andrew of the Fratte to gaze at its Bernini-sculpted angels, then check out the painted optical illusion of a dome at the Church of St. Ignatius. Step inside the Church of St. Mary over Minerva to admire its art and architecture, and take in acclaimed pieces of artwork by Caravaggio, Sansovino, and Raphael at the Church of St. Agostino. More Caravaggio treasures await in Piazza Navona at the Church of St. Luis of the French. As you take in the highlights of each place of worship, you’ll learn about the wealth of baroque artwork that can be found around the capital. After roughly three hours, your tour ends in central Rome at a place that's convenient for both your guide and group.